How would you like to hear a new side—or should we say sides—of the world’s greatest funk band? This 40-track set presents the A and B-side of every single that organist Art Neville, guitarist Leo Nocentelli, bassist George Porter, Jr., and drummer Joseph “Zigaboo” Modeliste cut for the Josie, Reprise & Warner Bros. label, virtually their entire singles output save for a few odds ‘n’ ends issued mostly overseas. 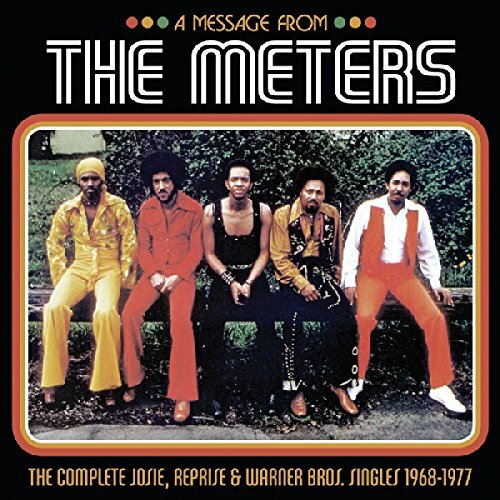 That means that you not only get every hit along with its hard-to-find B-side but also the rare single mixes, including the especially rare original mono single mixes of the 1968-1971 Josie sides, very few of which have appeared on CD (the first CD is all mono; the second, featuring the later Reprise and Warner Bros. singles, presents all stereo single mixes). These songs represent the mother lode of New Orleans funk, classic tracks like “Sophisticated Cissy,” “Cissy Strut,” “Look-Ka Py Py,” “Chicken Strut,” “Hand Clapping Song,” “Hey Pocky A-Way,” and more, all but two co-produced by the late, legendary Allen Toussaint. And, with liner notes by Bill Dahl featuring quotes from Nocentelli, Neville, and Porter, this 2-CD set offers probably the best retrospective to date of this enormously influential band. And how’s the sound? Well, after extensive and exhaustive tape research, we were able to come up with original tape sources for all but five of these single sides, and the remastering—by Mike Milchner at SonicVision—is tight! Just maybe the year’s most indispensable R&B release.